What is saddle sewn binding? Saddle Sewn binding is a book binding technique achieved by sewing together landscape folded pages with a cover into a portrait book. The stitching itself is done on an industrial sewing machine and lies on the spine of the book. When to use saddle sewn binding? This form of binding is commonly used in portfolios and for designers wishing to display artwork, as the margin on the instep of the book is wider than other forms of binding. Because of the nature of the fold or crease, saddle sewn books are only appropriate for thin book of 48pp or less. 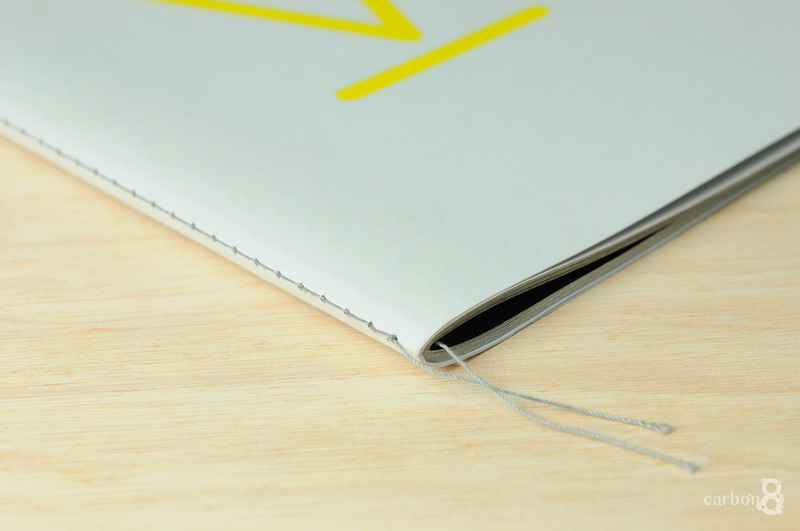 Saddle sewn binding is a simple, durable and cost effective way to embellish your book. How to use Saddle sewn binding? Saddle sewn binding can be used to create a hand crafted high quality look at a reasonable cost, especially for small quantities as the setup is relatively inexpensive vs. other binding techniques. The ends of thread can be left loose or tied off and trimmed to create the finished look the designer is after. Many colours of thread are available to make the binding stand out or blend in based on the designer’s intent. Alternatives to Saddle sewn binding? For a traditional hard cover look that is very durable, case binding make sense. If you need your book to lay open and flat, lay flat binding is the best option. If you like the sewn look, and want to accentuate this aspect, oversewn binding is a slightly more expensive option.